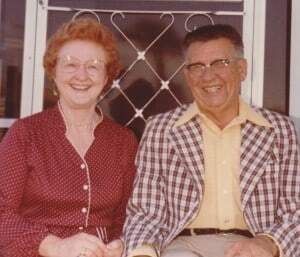 I’ve been thinking alot about my Grandpa and Grandma Renelt this past week. They’ve been on my mind more than usual because my family just returned from a vacation in Florida, the warm and endlessly sunny state where my grandparents used to spend many of their winters. While I was growing up, our family traveled to stay with them several times over the years, and those visits produced loads and loads of happy memories for me. So much of last week’s vacation time felt like I was reliving trips from the past. Except this time I was the parent! Grandma definitely knows her way around every corner of the kitchen, but I especially loved our Florida breakfasts together where she treated us to fresh squeezed orange juice. And not the “fresh squeezed” kind from the store’s jug like we drank every morning last week on vacation. No, Grandma squeezed those sweet Florida oranges with her own two hands, no electric gizmos involved. I think that must be how you know someone loves you. Another favorite, and still extremely simple, eat that Grandma introduced me to was her Fresh Ginger Dressing. I’ve always loved it, but it wasn’t until just a few years ago that I asked her for the recipe. She laughed that vivacious laugh of hers and then said, “Recipe?! I don’t have a recipe!” So I proceeded to make her guesstimate the measurements of ingredients. 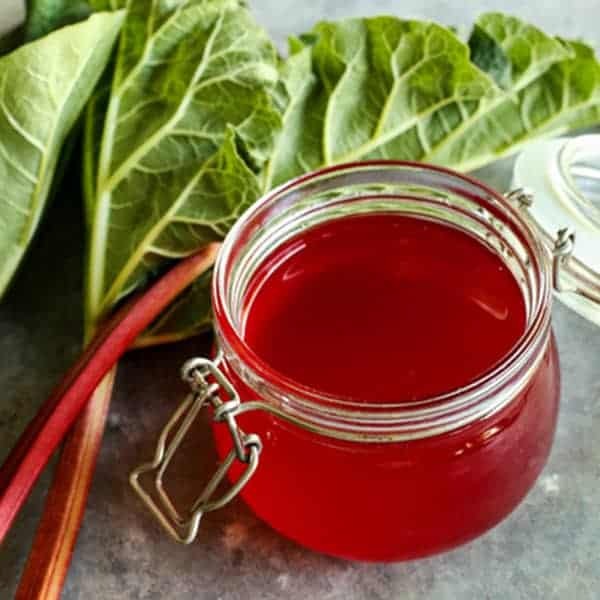 I like to play around with my grandma’s recipe by experimenting with different vinegars and sweeteners. And the amount of ginger I use completely depends on my mood. Sometimes I want mellow ginger. Other times I want it full throttle, spicy and full of zing. But the recipe I’ve included is how I most commonly make it, and a great place for you to start. I like to drizzle this fresh ginger dressing over my salads any time of year, but its light body and bright flavor is especially nice during the warmth of spring and summer. Please let me know if you try it! Combine all ingredients in a pint jar and shake vigorously. Or if you like a more well-blended dressing, place ingredients in a smallish bowl and give it a few whirls with an immersion blender. Then store in a pint jar, shaking vigorously before each use. Serve with your favorite fresh greens. Keeps well in the refrigerator for one week. Adapted from my Grandma Renelt’s recipe box, one of my favorite recipes in all the world. I love the fresh taste of ginger. This dressing looks divine, nice and simple to make too. I’ll have to try it. It looks perfect for a crisp green salad. We enjoyed your dressing at the lake tonight with Mom and Dad! It is always so good! Anything ginger is a yes for me. I will try this one out. Thanks for sharing..
Aw, appreciate the love in this one. I’ll always keep the recipes my Grandma wrote out for me on index cards in her Palmer Script handwriting. Miss her. I got to enjoy the ginger dressing at Mom’s this weekend. YUMMY!!! Yay! It’s just so good. I even got the girls eating it this spring – they love it now, too! 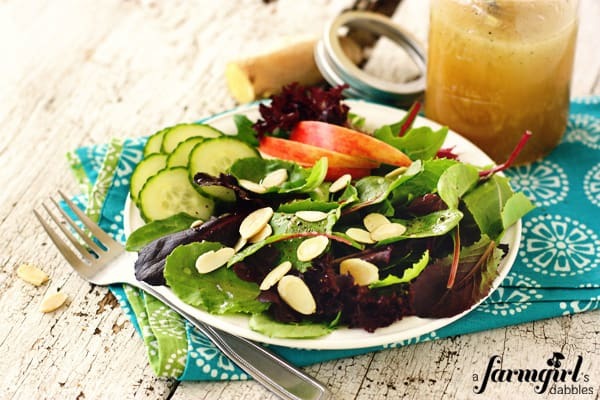 Love this ginger vinaigrette…so delicious and pairs so well with the salad. Brenda I love the picture of your grandma…she just looks like she is a fun gal! This salad dressing sounds divine, I am definitely adding it to my list of salad dressing! Thanks again for linking up! I can’t wait to try this one. Ginger dressing? Yes, please! Family recipes are the best. You can taste the love! Hi Angela! So very lovely to hear from you. Will you be at TECHmunch on 06.02? I cannot wait to try this recipe. Grandmas recipes are the best, always. Love the pic of your grandparents! 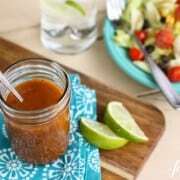 Oh, ginger dressing is one of my faves! Happy to see your rendition – or your grandma’s! I love those recipes that are close to our hearts – it makes eating them so much more of a sweet treat! This dressing sounds perfect for summer salads! I doubt anything makes food more tasty than the memories connected to it. Thank you for sharing an awesome recipe! I will most definitely have to try this soon! Is there anything better than our memories of food and family? Thank you for sharing. 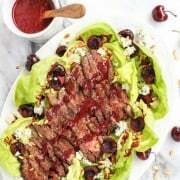 The dressing looks delicious! I love a good homemade dressing and a cherished family recipe! This dressing looks like it would be good on just about any salad. Lovely ingredients! This sounds like a wonderful topping for a fresh summer salad. Love that your grandmother never had a recipe and just went with her heart when making this. I think that trait has been passed on. What great memories of your childhood vacations spent in Florida. Lovely picture of your grandparents. This sounds so refreshing, Brenda. I love hearing these stories too. Just lovely! Thanks for sharing this recipe, Brenda, and the story that goes along with it. 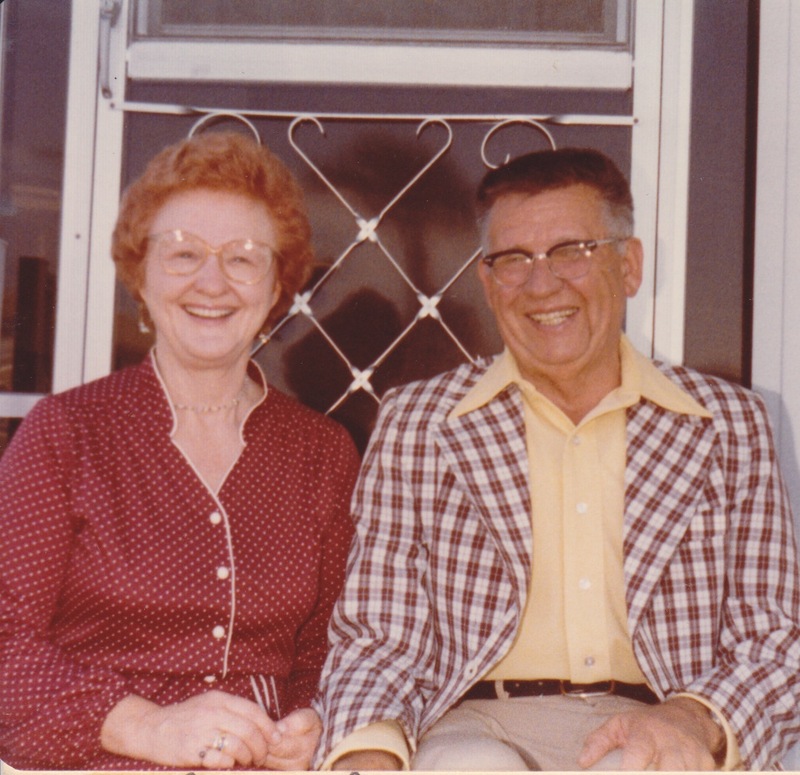 It made my heart sing to see that picture of Mom and Dad with those big grins on their faces. Perfect! Just the way I think about them, and all those wonderful memories we made with them in Florida. Love this dressing! 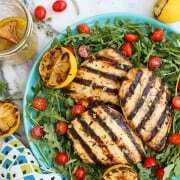 I can’t wait to try it on my salads this summer! Is there anything better than fresh-squeezed (by hand) orange juice? Yum! And this dressing? Oh my goodness does it sound delicious! Over here from Add A Pinch. I love old family recipes and this sounds delicious. Your photos look delicious, too! Ginger is one of my favorite flavors. 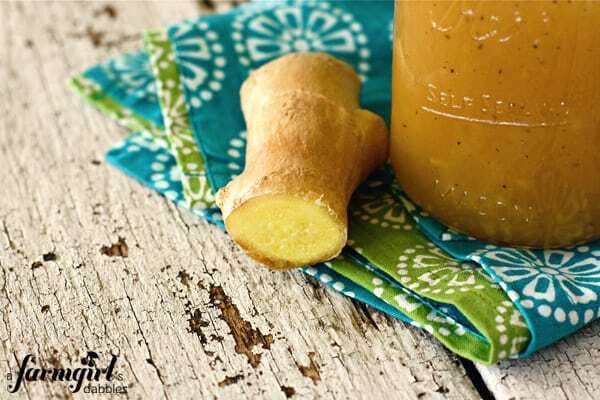 I love ginger water, ginger candy…I can even eat crystallized ginger by the handful. This sounds amazing! 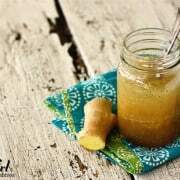 I will definitely try it, I love all things ginger! Sounds delightful. Ginger is one of my favorite flavors. To a fault almost. 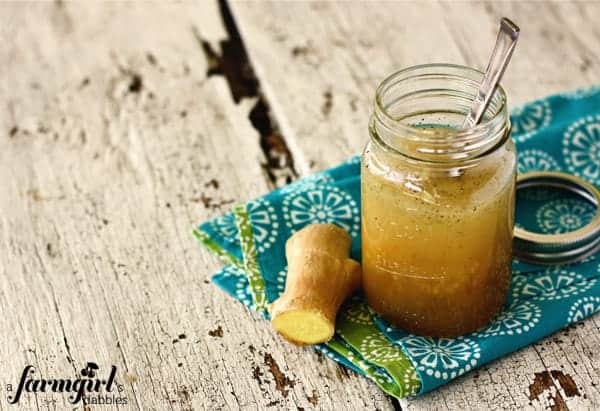 thank you for sharing this recipe – i’m a ginger FREAK.